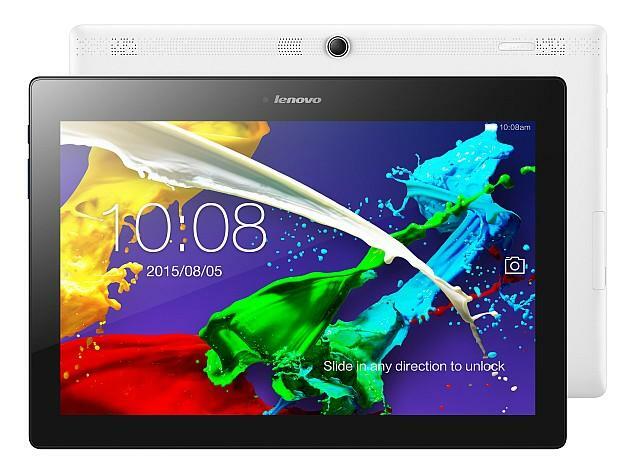 Lenovo Tab 2 A10 specifications:-Â Lenovo has launched two budget Tablets at CES 2015 dubbed Lenovo Tab 2 A8 and Tab 2 A10. Both tablets runs on Android operating system.Tablet comes up withÂ Dolby sound technology.Â Both the Lenovo Tab 2 A8 and Lenovo Tab 2 A10 tablets look identical and share some almost similar specifications.It isÂ available in Aqua Blue, Cotton Candy, Pearl White or Ebony Black. To have a detailed look then lets have a direct jump over toÂ Lenovo Tab 2 A10 specifications, price, features and pros and cons. Lenovo Tab 2 A10 features a 10.1-inch display withÂ 1920×1080 pixel resolution andÂ pixel density of 218 ppi. Device runs on android 4.4 kitkat and there is no word from company about its android update. Slate is powered byÂ is powered by a 1.5GHz quad-core MediaTek MT8165 processor underneath combined with Mali-T760 MP2Â and 2 GB RAM for fast processing.For storage the device is equipped with 16 GB internal storage which can be expended up to 32 GB via microSD card. Lenovo Tab 2A10 boards 8-megapixel rear camera and 5-megapixel front camera. The device measures 171.00 x 247.00 x 8.90mm and both weigh 509 grams with thickness of Â 8.9mm.. It is backed by 7200 mAh and for connectivity there is wifi, Bluetooth,Â GPS, A-GPS,Â USB 2.0 and 3G. Lenovo Tab 2 A10 Â is priced at $ 199 and Rs. 12,537 in India.